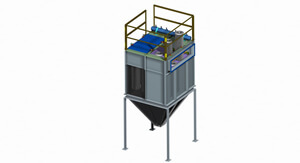 Jet Pulse Cartridge Filters have the same working principle with bag filters and as a filtration material cartridges are used instead of bags. 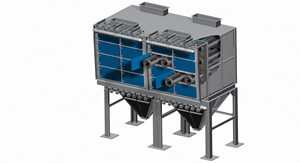 Cartridge filters based on the working principle of getting more filtration area compared to the bags with the same diameter dimentions by pleating the surfaces dusty gas passing through have come into use widely in the recent years because of their ability to get high capacities with lower filter dimentions. Low investment cost due to getting high filtration area with fewer filter components and maintainability ( fewer equipments to be maintained) are important factors to prefer cartridge filters.